The 1971 Corvette is an ideal 2-door coupe or convertible vehicle designed for the enthusiasts of sports cars. The vehicle was manufactured by Chevrolet, and it is fair to say that it was a fitting match for other sport vehicles with much higher price tags. Indeed, the 1971 Corvette can easily be classified as being among the top engineering works that originated from United States. Before Chevrolet designed the 1971 Corvette Stingray, it had released other Stingray models in the market, and some of these models’ specs were carried over to the Stingray. In 1969, ‘Stingray’ now appeared as one word on the cars’ front fenders unlike in previous models where ‘Sting Ray’ was used. In the same year, the front grilles were made all black, and the backup lights incorporated in the inboard lighting. It was also the only year that the ZL1 engine option was used, and the final for the L88 engine. The former had an all-aluminum 427 cu in 7.0 liter big block engine with 430 horsepower. In 1970, however, the fender flares were designed into the body contours. This model modified the exhaust outlets by making them larger and rectangular. The model’s designers also included egg-crate grills that had matching front fender side vents. However, the 1971 Corvette remains to be among the least changed model in the entire production history of the Corvettes. How so? In May 1969, the United Auto Workers labor dispute occurred. This dispute led to that year’s model to be run over by two months. It also minimized the production of the 1970 Corvette. For that reason, the 1971 Corvette was to be designed as an extension of the 1970 model. The 1971 Corvette has both the manual and power steering. The manual steering has a semi-reversible gear with ball-nut that is driven by recirculating anti-friction bearings. It has a two position steering knuckle arm attachment to enable fast ratio and street steering. The steering also has a steering damper connected to the relay rod, and it has a steering column that is energy absorbing. The specifications for the power steering are similar to those of the manual steering except that it has a pump powered cylinder, assisted linkage, and hydraulics. In comparison to the previous models, the 1969 and the 1970, the Stingray’s designers detuned the 1971 Corvette’s engine with minimized compression ratios to withstand lower octane fuel. The vehicle’s engine was the LS6 454 cu in 7.4 liter big block. This also featured aluminum heads, with a 425 horsepower. The 1971 Corvette was available with an automatic transmission as well as a 4-speed manual transmission. The vehicle’s engine block numbers are 3970010, which had 350 cubic inch, 270 horsepower, and 330 horsepower and engine block number 3963512, with 454 cubic inch, were equipped with the LS5 with 365 horsepower at a $295 option, or the LS6 with 425 horsepower at a $1221 option! The 1971 Corvette standard brakes are the caliper disk, 4 wheels hydraulics. There is also the J50 type of brakes that are the Delco-Moraine vacuum assisted power breaks. In 1971, this was an option with a cost of $47! The drum diameter for both the front and rear brakes are 11.75 x 1.25 inches. The swept drum’s effective area is 461.2. The standard wheel type for the 1971 Corvette is the short spoke spider or welded steel. The standard wheel size for the Corvette are 15 x 8.00 inches. The tires vary from standard, the PT6, and PT7. All the tires are F70 x 15 – 4PR, 2-Ply, but the standard is a tubeless nylon, the PT6 is a red stripe nylon, and the PT7 is a white stripe nylon. The 1971 Corvette has the capacity for two, the driver and a passenger. The interior trunk has a volume of 20 feet. The crankcase capacity for the 350 cubic inch engine is 4 quarts and for the 454 cubic inch engines is 5 quarts. The battery capacity for 350ci engines is 12 volt and 62AH, while for the 454ci engines is 12 Volt and 80AH. 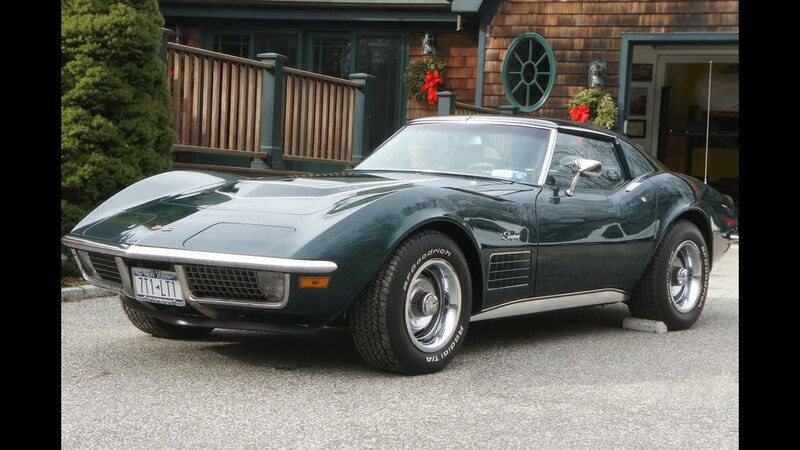 The 1971 Corvette is available in ten exterior colors such as Nevada Silver, Sunflower Yellow, Classic White, Mille Miglia Red, Mulsanne Blue, Bridgehampton Blue, Brands Hatch Green, Ontario Orange, Steel Cities Gray, and War Bonnet Yellow. The interior colors are black, dark blue, dark green, red, and saddle. There are a number of dealerships around that can offer support to your 1971 Corvette in case you experiences glitches. Like all other cars, the Corvette requires regular and routine maintenance depending on how much and how hard you drive this beast. Having detailed information about the car model will greatly assist you in any desired repair or restoration should you decide to tackle it yourself. Alternatively, there are many Corvette clubs around. All you have to do is call them and an expert will come to help you out. Get on CorvetteForum.com and CorvetteActionCenter.com where you can discuss with other Corvette enthusiasts. The Corvette can be tuned to fine performance by making little adjustments to it. After all, it was designed to be a sports vehicle. It is possible to fit the car with performance parts acquired from a certified dealer. The suspension can be adjusted, and it can be upgraded to an LS small block and 5 speed transmission. The car can further be tuned up by bolting up the sway bars, changing the control arms, and the Corvette is good to go. The pricing for this vintage vehicle was at $5,259 for the convertible, and $5,496 for the coupe. Today, you can find this model on websites such as eBay.com for as little as $20.000. Prices do vary and can exceed $150.000 for very rare models. The 1971 Corvette stands out to be one of the most spectacular engineering works in America. This car model was created following the 1970 model because of the strike that had occurred. It is a vehicle, that in good condition, will always retain its high value. The 1971 model is available as both coupe and convertible, and Chevrolet specifically designed it to fit in as a luxury and racing vehicle.